What is LEED: Leadership in Energy and Environmental Design (LEED) is a third-party certification program and an internationally accepted benchmark for the design, construction and operation of high performance GREEN buildings. What is FSC: In LEED Canada, the requirement for Certified Wood is to provide a set percentage, by cost, of wood-based products and materials certified in accordance with the Forest Stewardship Council’s (FSC) standards. FSC requires that all companies providing wood-based products are FSC chain-of-custody (COC) certified to ensure the integrity and accuracy of the FSC claims that accompany the material through the supply chain.LEED projects specify that the architectural millwork fabricator only buy FSC certified wood from a FSC certified supplier chain, with a paper trail of purchased product that must be submitted to the Architect at the end of the project. What is VOC: Volatile Organic Compounds. LEED projects specify use of low VOC emitting materials such as adhesives(contact cement),sealants(silicones), and finishes(paints/lacquers). What is NAUF: No Added Urea Formaldehyde. Urea and Formaldehyde create a resin used as a permanent adhesive. Alternative adhesive systems that qualify for the NAUF category include: Phenol Formaldehyde (PF), Poly vinyl acetate (PVA) and Soy. 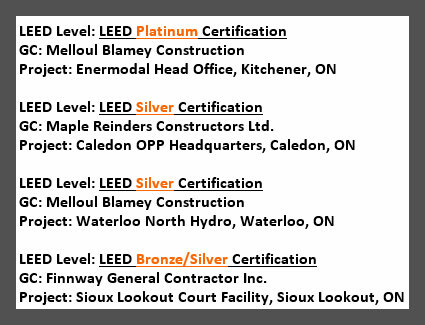 The popular LEED (Leadership in Energy and Environmental Design) certification has made the term NAUF a mainstream term in indoor air quality and the construction industry.LEED projects specify no added urea formaldehyde or no formaldehyde resins to be used in sheetgood products such as particleboard,medium density fibreboard(MDF),or plywoods.